For iPhone users, you can shot 4K video with iPhone built-in video camera apps since the iPhone 6S. When the shooting is done, some people try to transfer and play the iPhone 4K video on computer with the powerful 4K video player app – VLC media player. However, some people complain that the VLC is struggling to play the 4K MOV file recorded by iPhone. “Hi everyone, VLC is struggling to play an MOV file recorded by my iPhone (There’s so much lag it’s not viewable, audio works fine.) The video files are in 4K so I’m wondering if that’s the problem. (video file screenshot below). Never had issues with playing other videos but this is the first time trying to play 4k video. My laptop is a Dell XPS 9550 – i7 and 16GB (screenshot below) is that good enough specs to handle it? VLC is up to date, 2.2.6. Is it possible to play these videos without issues using my laptop? Why VLC struggle to play VLC iPhone 4K video? As a matter of fact, you’ll often encounter choppy playback in VLC Media Player when playing high resolution especially 4K video files. The good new is that you may under certain circumstances benefit from gpu accelerated decoding in the VLC media player to smooth things out. However, from VLC’s GPU Decoding page, it is only available for H.264 streams. As for the 4K H.265 video shot with iPhone 8/8 Plus/X, using GPU accelerated decoding on VLC will be non-sense. In addition, the GPU decoding is only available for Windows Vista and newer versions of the Microsoft operating system, Windows XP is not at this point in time. This also means if you try to watch iPhone 4K video with VLC on Mac, the GPU accelerated decoding will fail to work. Obviously, enable GPU accelerated decoding in VLC won’t be an effective solution to fix the VLC iPhone 4K video playback struggling issue. If you are looking for a more reliable way to play iPhone 4K video on VLC with no stuttering problems, we highly recommend you to compress iPhone 4K video to 1080p. 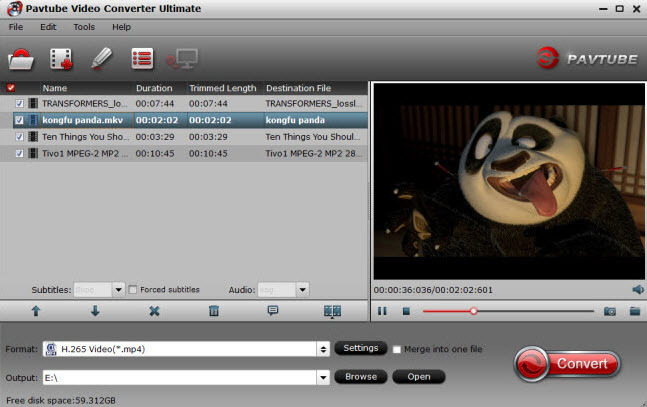 Here, you can get the job easily done with our professional 4K Video Converter - Pavtube Video Converter Ultimate. The program has perfect importing support for both the 4K H.264 MOV and 4K H.265 MOV video shot with iPhone 6S/6S Plus/5SE/7/7 Plus/8/8 Plus/X. Thanks to its batch conversion mode, you can load multiple iPhone 4K video into the application for conversion at one time. You can easily produce VLC media player compatible smooth playback 1080p or 720p video formats such as H.264 HD MP4, H.264 HD MOV, H.265 HD, MPEG-2 HD, MPEG-4 HD MP4, etc with perfect quality and super fast encoding speed. Tips: For those people who wish to encode HD H.265 or HD H.264 video from iPhone 4K video, you can take good advantage of the hard-ware encoding acceleration technology offered by the application. And up to 6x faster H.264 codec encoding speed can be achieved as long as you run your computer on Nvidia CUDA or AMD App technology based Graphic cards, 30x faster H.265 codec encoding speed can be achieved as long as you run your computer on Maxwell (GM206) or Pascal based Nvidia graphics card. For Mac users, please switch to download Pavtube iMedia Converter for Mac to complete the conversion on on macOS High Sierra, macOS Sierra, Mac OS X El Capitan, Mac OS X Yosemite, Mac OS X Mavericks, etc. Tips: Hard-ware encoding acceleration for H.264/H.265 codec is not available for the Mac version of the this application. How to Compress iPhone 4K Video for VLC Media Player Smooth Playing? Step 1: Load iPhone 4K video into the application. Download the free trial version of the program. Launch it on your computer. Click “File” menu and select “Add Video/Audio” or click the “Add Video” button on the top tool bar to import iPhone 4K H.264 MOV or H.265 MOV video files into the program. 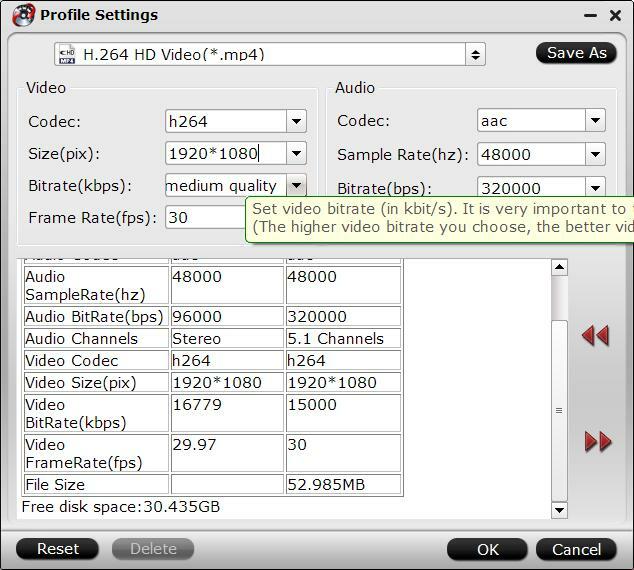 Clicking the Format bar, from its drop-down list, select VLC most compatible and smooth playback HD file formats “H.264 HD Video(*.mp4)” under “HD Video” main category. Step 3: Compress 4K video to 1080p. Click “Settings” on the main interface to open “Profile Settings” window, click “Size(pix)” to select 1920*1080 as the final resolution for output video. You can also tweak other settings to make them more fit with VLC. After all the settings is completed, hit right-bottom “Convert” button to start to convert and compress iPhone 4K video to VLC best compatible 1080p H.264 formats. Now, feel free to play the downscaled iPhone 4K video on VLC. It should be smooth when playback.